Making history again today. The Life of Pablo is yours streaming exclusively on TIDAL.com. Back in February, Kanye West famously tweeted, “My album will never never never be on Apple. And it will never be for sale... You can only get it on Tidal.” As a result, TIDAL reportedly experienced a large increase in subscribers—TMZ suggested that the company more than doubled its user base. But on March 31, TIDAL's hold on The Life Of Pablo ended, and the album appeared on Spotify and Apple Music. 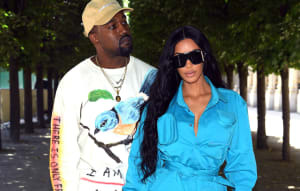 AP reports that Justin Baker-Rhett, a Kanye West fan, is now suing both the star and TIDAL on the grounds that the platform tricked people into signing up for its service with false promises of exclusivity. Baker-Rhett’s suit also argues that “Mr. West’s promise of exclusivity had a grave impact on consumer privacy,” suggesting that the consumer information the company gained from all the new subscribers is worth $84 million. The document asks that a judge order TIDAL to delete the information it acquired from those who signed up just to hear Kanye’s album. Representatives for TIDAL and Kanye West were not immediately available for comment.